Quick and easy meals for the beginner that evGrandma would eat! by Mazthegob! My name is maz and I'm one of the guys from the Cowley club in sunny Brighton, I'm writing to you to tell you about a new vegan cookbook I've written called "the chip butty vegan" its aimed at new vegans and veggies with the idea of keeping them on the path they've choose, the recipes are very simple easy to follow, and of food that the average meat eater would recognise, i remember when i turned vegan and went out bought a load of cookery books, and they had ingredients i didn't recognise and it was a real culture shock, luckily I'm very stubborn lols. 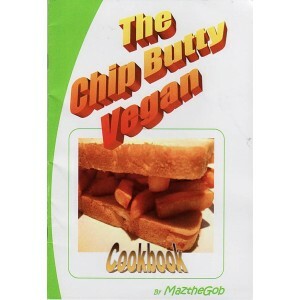 Nothing to freaky in this cook book no lentils (except for the dhal lols ) no tahini etc you could serve the dishes to yer granma and she wouldn't know the difference lols I've been a vegan for over 25 years and was a fully qualified chef but now a retired due to illness wildlife and marine life medic. P.S. the booklete has 40 pages and below is a list most of the dishes.